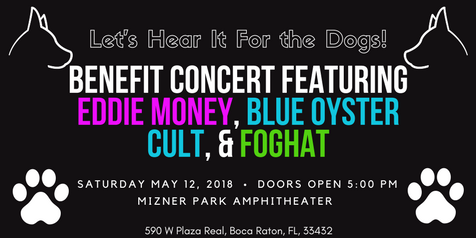 On Saturday, May 12, 2018, popular feel-good Rock n’ Roll artists Eddie Money, Blue Oyster Cult, & Foghat will hit the stage at Mizner Park Amphitheater in Downtown Boca Raton, FL. Eddie Money will be headlining the show, playing classic sing-along favorites like “Take Me Home Tonight” and “Two Tickets to Paradise.” Blue Oyster Cult & Foghat will be performing well-known hits like “Don’t Fear the Reaper” and “Slow Ride,” with the local band The Livesays opening the show. Doors to the event will open at 5:00 pm, with the show beginning at 6:00 pm. Presented by Gabriel Entertainment in association with Rescued Puppy Productions, this rockin' benefit concert will raise funds to support local dog shelters & help our local rescued four-legged friends in need. Gabriel Entertainment & Rescued Puppy Productions provide support to local no-kill shelters and canine rescue and wellness facilities throughout Palm Beach County, FL. They are committed to working with and supporting the local Dog Rescue Community, raising awareness of the importance of supporting local Spay & Neuter programs, and developing a network of supporters & volunteers in order to create a better life for our local homeless pets. A portion of the proceeds will go toward this incredible cause, and there will be a donation station located at the venue’s entrance accepting much-needed donations of canned and bagged dog food, new dog toys, and new dog bedding items. Visit the event website for the complete list of acceptable donation items that local rescue shelters are currently lacking in supply. Each person who donates an item for the local shelters will receive a complimentary raffle ticket for the multiple gift drawings which will take place throughout the show. There are a variety of seating options for the event, with advance ticket purchases available online, or by phone at 1(800) 745-3000. General admission tickets are $60, $100 for VIP clock towers tickets, and $150 VIP Table seating. Please visit the Mizner Park Amphitheater website additional venue info and answers to frequently asked questions.